CATCH OF THE DAY: Everyone with a pulse (vampires were not included in this survey) knows that Sarah Michelle Geller is best known for her breakout role as the title character the late, great WB Drama, Buffy The Vampire Slayer. Most recently, however, Geller took a new role as Sydney Roberts in CBS's new comedy The Crazy Ones. 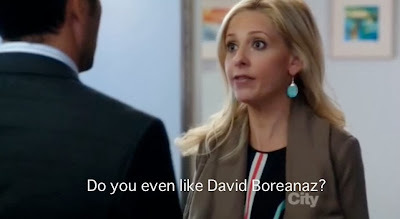 But, if you aren't keen with actors' names or Buffy story lines, or if you're one of those people who's been watching The Crazy Ones for Robin Williams, then this Buffy actor reference in episode 1x06 "Hugging The Now" might have passed you by. In the early seasons of Buffy the Vampire Slayer, Buffy fell in love with a vampire named Angel, portrayed by actor David Boreanaz. This noteworthy role led Boreanaz to his own spin-off series named after the character, but nowadays Boreanaz is known as FBI Special Agent Seeley Booth on FOX's long running drama Bones. It should comes as no surprise then that the writers of The Crazy Ones had Sydney spend nine hours one night unashamedly marathoning Bones. Careful, Sydney. Your Buffy is showing.